President Donald Trump's administration announced that it will take a new, more aggressive approach to manage federal lands in a way that will reduce the risk of damage from wildfires like the record-setting fires in California and other western states. Agriculture Secretary Sonny Perdue just returned from visiting the fire zones in California with Interior Secretary Ryan Zinke and said the administration will take a "smarter, more aggressive approach" to combatting forests on federal lands, including removing some trees or plants that could act as kindling to start fires or help them spread. "These horrible events just like last year are stark reminders of the immense forest fire health crisis in this country and the urgent need to dramatically increase our preventative forest treatments," Perdue said Thursday. 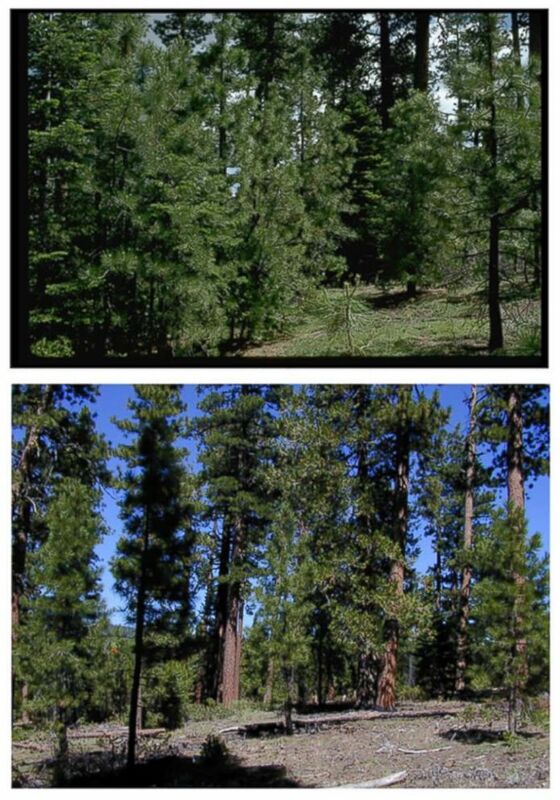 A Forest Service photo shows an area of ponderosa pines before and after the process of removing potential fuel for wildfires. The announcement comes after several days of criticism over whether the administration is acknowledging the role of climate change in exacerbating wildfires through hotter conditions. Trump said Thursday that "it's not a global warming issue, it's a management issue." Zinke has also said wildfires are a management issue and not a political issue, referencing a debate about the influence of climate change on making fires larger and more severe. He told reporters at the White House on Thursday that "of course" climate change is part of the problem. 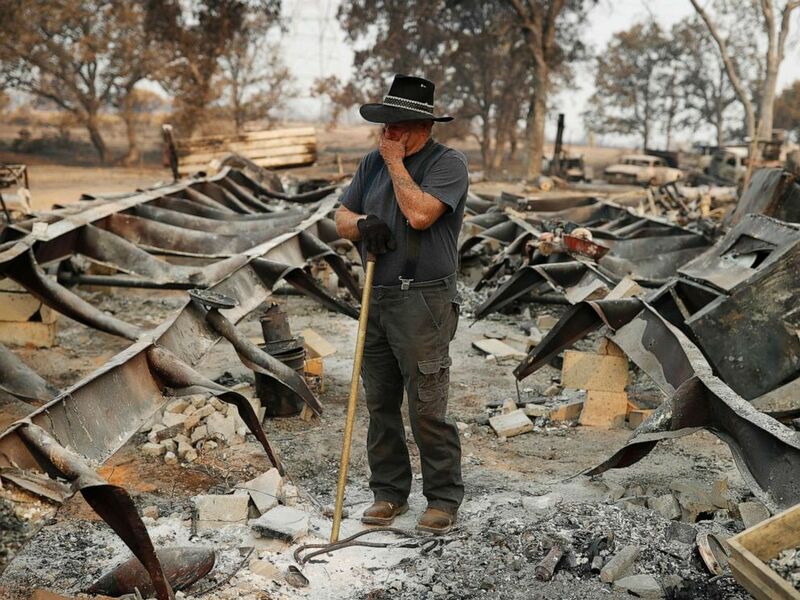 Some researchers argue that this emphasis on management oversimplifies the factors that contribute to wildfires and that the administration needs to consider multiple approaches -- including rules related to homes and buildings in areas prone to fire, as well as the impact of climate change. The U.S. Forest Service and the Interior Department both manage federal lands, including clearing dead or dying plants and working to prevent or limit damage from wildfires. Perdue has criticized the lack of funding for the Forest Service in the past, saying that until a recent funding fix the department spent more than 50 percent of its budget fighting fires and did not have enough resources to prevent them. These horrible events just like last year are stark reminders of the immense forest fire health crisis in this country and the urgent need to dramatically increase our preventative forest treatments. After the devastating wildfire season last year, Zinke directed managers on federal lands to take a more aggressive approach to removing trees or brush that could become kindling for fires. But Zinke has also been criticized for comments blaming "radical environmental groups" for filing lawsuits to block the government from removing too many trees or other plants that could provide cover for endangered animals that live in the forest. Some environmental groups pushed back after Zinke said during a conservative radio interview that "environmental terrorists" were holding the government hostage. "Every year we watch our forests burn, and every year there is a call for action," Zinke wrote in a separate op-ed last week. "Yet, when action comes, and we try to thin forests of dead and dying timber, or we try to sustainably harvest timber from dense and fire-prone areas, we are attacked with frivolous litigation from radical environmentalists who would rather see forests and communities burn than see a logger in the woods." Forest Service officials said that 129 million trees in California have died since 2010 because of conditions caused by climate change, drought and insect infestations. Critics of this approach have also alleged that the administration wants to make more federal land available to the logging industry. Zinke implied in a Cabinet meeting on Thursday that salvaging dead or dying timber could even reduce the price of lumber, which has increased since 2017 -- and after the Trump administration enacted tariffs on lumber imported from Canada.